Standing atop the impressive cliffs on Long Island near Tiverton in Nova Scotia, Canada, the Boar's Head Lighthouse watches over the fury of the Bay of Fundy. Constructed in 1864, the lighthouse aided the shipping vessels into Petit Passage which separates Long Island from Digby Neck. Long Island was founded in 1604 but no settlers made this home until the late 1700's at which time the land was given to the British loyalists who fought in the American Revolution. On this small island of 15 kilometers in length and 5 kilometers in width, tourists will find scenic coves, lakes, tidal bores, whale watching, the Boar's Head Lighthouse, beautiful scenery and many other fascinating things. 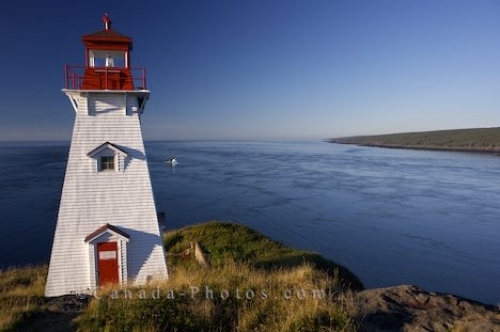 For visitors to Nova Scotia wanting to see the Boar's Head Lighthouse and enjoy the scenery of the Bay of Fundy, turn right at Tiverton on Long Island until reaching a gate. This gate is often shut, so people park and walk the cliffs to the lighthouse. Picture of the scenery of the Bay of Fundy in Nova Scotia from the cliffs at the Boar's Head Lighthouse on Long Island. Boar's Head Lighthouse on Long Island, Bay of Fundy, Digby Neck and Islands Scenic Drive, Highway 217, Nova Scotia, Canada.